Microsoft receives some stick from the web development community for IE6. The bygone bug-ridden browser is the bane of our lives, and the revelation that Microsoft will support IE6 until 2014 was met with contempt. However, let’s make one thing clear: Microsoft has no interest in prolonging the life of IE6. It’s life may have been inadvertently extended by their inaction, but MS want users to upgrade to IE7 or, preferably, IE8. 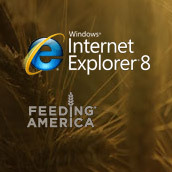 To that end, Microsoft is donating 8 meals to Feeding America, a US hunger-relief charity, for every download of IE8 from their Browser For The Better web site. If you’re upgrading from IE6, Microsoft will double that donation. Feeding America provides food assistance to more than 25 million low-income people facing hunger in the United States, including more than 9 million children and almost 3 million seniors. Microsoft is donating up to $1 million and each IE8 download will contribute at least $1.15 toward the charity. If you’ve been holding off your upgrade, perhaps it’s time to succumb to the delights of IE8. It’s a fine browser. Honestly. And you’ll be doing your bit for charity.